President Sirleaf, as she announces the reshuffle of her Cabinet. Monrovia, Liberia - President Ellen Johnson Sirleaf has begun the reorganization of her Cabinet, effecting the first reshuffle since the commencement of her second term as President of Liberia. According to an Executive Mansion release, President Sirleaf said in a statement, broadcast live, that after deep reflection, she had decided to begin reconstitution of her new Cabinet to reflect age, gender, religion and ethnicity. This, she said, continues to guide her actions in the conduct of the affairs of the State. On the inclusion of young people in the reconstituted Cabinet, President Sirleaf stated that while she and others can expect them to occasionally err in the exercise of their duties, the truth remains that the future of the country belongs to the youthful generation. 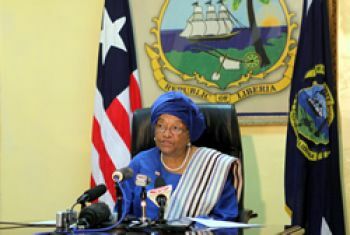 “It is time that our young people begin to work with us – to take on more and more responsibility for the future of our country – and to deepen their understanding of exactly where we are headed, the challenge associated with getting us there, and the discipline and dedication that will be required,” the Liberian leader declared. She made it clear that she has transferred some individuals from one area of responsibility to another, while a few have not been reappointed. This action, she said, is intended to provide an opportunity to bring new dynamisms to new responsibilities. President Sirleaf stressed that in cases where some individuals have not been reappointed, it is mostly because they are better suited to pursue their professions in other areas of endeavor. She thanked all of these individuals for their various services to the country. She wished those who are not returning to the Administration best wishes in their future undertakings. President Sirleaf then announced the nomination, and appointment, as appropriate, of the following persons to different positions in Government, stressing that she will make additional nominations and appointments over the next few days. Mr. Stephen B. Dorbor, Sr. - Deputy Minister, Planning and Human Resource Dev.